You may be tempted to use generic parts on your Honda vehicle for repairs or maintenance. Whether you're doing the job yourself or taking it to a service center, it's important to insist on genuine Honda parts. Don’t underestimate the impact this decision will have on your vehicle. The difference in design is small. In fact, it is so small that you may not even be able to tell just by looking. However, with vehicles that measure parts in millimeters, these tiny differences can have a big impact on the efficiency and performance of your vehicle. Because of the precise specifications, genuine Honda parts will last longer with the right care. There is not as much play between the parts that can cause more wear and tear. Many times, you will find that the last even longer than the manufacturer’s suggested replacement date. You can even purchase remanufactured parts from Honda, which gives you original parts in almost-new condition. They are tested to ensure that they work as expected, so that you never have to worry about unexpected breakdowns due to poor-quality parts. These Honda remanufactured parts come with a solid warranty that includes labor. When it is time to replace your air filters, fuel filters and other maintenance parts, genuine Honda parts are the best choice. They have been designed to work with the specific technology of your vehicle for optimal performance. In the past, the brand of parts didn’t matter as much because most vehicles operated similarly. Today, the vast differences in technology from one make of vehicle to another has a huge impact on how your vehicle operates. Honda technology is unlike any other brand on the road today. With technology that changes constantly, you want to know that the replacement parts are made to work with the innovation that is part of every Honda model. A prime example of innovative Honda technology is the Drive-by-Wire Throttle system. It enhances the driving capability of models such as the Honda Accord. The throttle pedal connects to the throttle butterfly valve in the intake manifold, which optimizes the engine response to fit the driving conditions. Components that make up this system and others that are affected will achieve their best performance when all parts are genuine Honda parts. If you want your Honda vehicle to last longer, need fewer repairs and provide optimal performance and efficiency, only genuine Honda parts will do. Once you see the benefits and compare the costs, the decision will be an easy one to make. 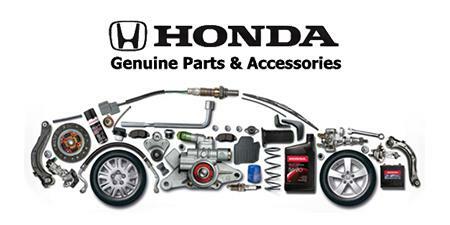 Order Your Genuine Honda Parts Today! Contact Us for Genuine Honda Parts Today!